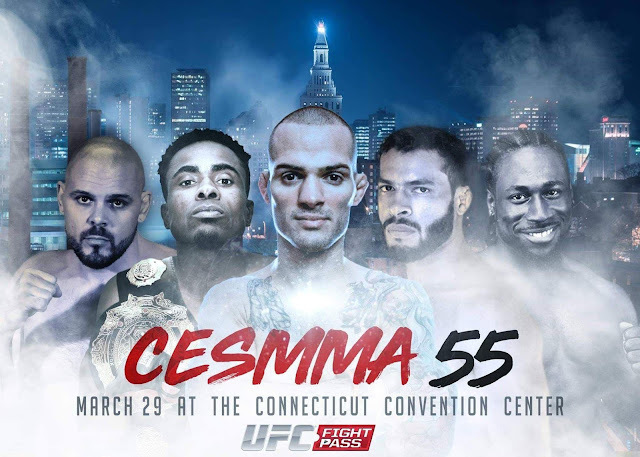 Hartford, Connecticut - We have arrived at the Connecticut Convention Center here in the heart of Hartford, Connecticut where CES MMA 55 will be going live starting at 7 pm Eastern time, with the main card starting at 9 pm Eastern and broadcast live on UFC Fight Pass. If you do not have UFC Fight Pass you can follow along here; with all the live action as it goes down from the banks of the Connecticut River. Share this article on social media and follow along throughout the evening as we keep you up to date on all of the goings on, live at CES MMA 55! *Disclaimer: Media row has been situated approximately 50 yards away from the cage and after the first fight I have realized I cannot always tell the fighters apart from this distance....bare with me New England! Round 1: Diorio comes out throwing a combination and clinches but Rivera gets back to distance briefly before Diorio closes again and Rivera turns and gets the takedown. Rivera works on the cage from half guard and switches to side control as Diorio looks to keep him close. Rivera moves to mount and looks for some ground and pound with his right hand. Diorio sweeps and ends up on top but Rivera gets back to his feet and they return to striking distance. Diorio comes forward with a combination and eats a knee from Rivera for his efforts, Diorio takes another knees and loses his mouthpiece. Fighters trade strikes as the first round comes to a close. 10-9 Rivera but could be close.. Round 2: Diorio comes out striking to close the distance and initiates the clinch but cannot secure a takedown. Rivera puts him on the cage but they return to stirking distance and Rivera lands. Rivera changes levels for a double leg and lands it as he starts to work from the guard of Diorio. Referee stands them up with nothing really going on on the ground and Carlos goes for another takedown and is stuffed by Diorio. They return to striking distance and are trading shots before they clinch yet again and Diorio has Rivera on the fence, they split as the round ends. 10-9 Rivera. Round 3: Diorio comes out behind the jab and backing Rivera down, Diorio lands an overhand right as he continues to stalk Rivera. Diorio initiates the clinch and has Rivera on the cage but Rivera turns out and we are back at striking distance, its short lives as Diorio puts him back on the cage. Fighters trade left hands and it seems like Rivera is bleeding from the nose, Diorio puts him back against the fence with a minute to work. Diorio lands some uppercuts to the body as Carlos backs out but Diorio clinches again and they break, Rivera lands a double leg at the fight clock expires. 10-9 Diorio. Round 1: Connolly is a full head taller than Pinheiro and takes advantage of that height early landing a headkick and some fists, and following it on the ground with elbows for the referees stoppage. Decision: Tom Connolly defeats Gil Pinheiro by TKO (Ground and Pound) at 19 seconds of round 1. Round 1: Fighters exchange looping combinations early as they looks to kick this one off striking. Huntley clinches and Valentin trips him to the mat and goes to work from the top. Huntley grabs a guillotine but its not a finisher. Justin attacks an armbar but ends up high and Huntley ends up on top in an arm triangle position, Huntley hops out of the guard and this looks deep, but Valentin defends and makes it back to his feet! Huntley keeps Valentin close and takes him down. Justin scrambles to the top as the round ends. 10-9 Huntley. Round 2: Justin comes out with a body kick and Huntley uses it to clinch and put Justin on the fence where he looks to grind on Valentin landing to the legs of Valentin. Huntley attempts a throw and Justin gets to his feet and returns to striking range. Huntley comes forward with a combination and trips Valentin to the mat and goes to work from top position and works in some elbows. Valentin gets up and lands a takedown of his own and works to side control, Huntley works back to guard and looks really comfortable from his back. Valentin ends the second round on top but with Huntley landing elbows as the round ends. 10-9 Valentin. Round 1: Ton comes out kicking the lead leg of Mima, Gravely shoots in and takes Mima down with a slam. Mima returns to the feet and is once again dumped by the champion. Mima looks for an Armbar and Tony Slams him on the mat to release the grip and Tony goes to work from top position. Tony is landing heavy strikes from the top as Mima pulls him in and looks to keep him close. Mima rolls to his right hip and looks for another armbar attempt but Tony defends the same way, once again with a slam to release Mima's grip. Gravely remains on top landing heavy right hands to the body as the round ends. 10-9 Gravely. Round 2: Tong comes out with a right hand and goes right for the takedown, Mima stuffs and now has a fairly decent guillotine attempt but Gravely fights through it and ends up on top in half guard. Gravely is working short elbows and right hands to the body from the top. Gravely stands up and looks to strike at a downward angle but there is nothing there and he returns to the mat in side control but Mima works back to half guard, Mima looks to escape by giving up his back with just 10 seconds to go and Gravely takes the back and sinks in a rear naked choke for the quick tap from Mima. Decision: Tony Gravely defeats Darren Mima by Submission (Rear Naked Choke) at 4:54 of the second round. Round 1: Rose comes out with a front kick followed by a combination and then a double leg but Acevedo reverses position and is on top of Hilarie, Hilarie threatens a leg lock but uses the distance to stand up and and puts Acevedo on the cage and eventually gets the takedown where she works from the top for the remainder of the round. 10-9 Rose. Round 2: Girls are coming forward throwing combinations and Rose puts some strikes together and Acevedo has had enough and takes Hilarie down. Acevedo works from the top and it looks like Hilarie is bleeding from the head/ear area, Hilarie gets the back and attempts a choke but Acevedo slams her off and they are back on the ground with Acevedo on Rose's back now as the round ends. 10-9 Acevedo. Round 3: Rose shoots in for the takedown and with a little work gets the fight to the ground and has top position briefly but Acevedo reverses the position and takes the top. Acevedo has Rose mounted and in a very compromising position but Hilarie is still working from the bottom with strikes. Hilarie escapes and gets back to her feet but is take back down once again as the fight ends. 10-9 Acevedo. Round 1: Castillo comes out throwing heavy leather but Dubuque lands s nice kick to the body but it doesn't stop the output of Castillo as he continues to throw bombs. Castillo shoots for a takedown and has Dan against the cage, Dan turns the action but eats a knee to the body to do so. They return to the center and Castillo starts swinging again. Dan starts to work on the lead leg of Castillo but Castillo still comes forward. Castillo shoots for a takedown and once again has Dan against the cage, Dan looks to escape but Castillo grabs the seatbelt and pulls him back in and eventually gets a brief takedown but Dubuque pops right back up as the round ends. 10-9 Castillo. Round 2: Castillo waves off the glove touch and the second round is under way with both fighters firing away. Castillo continues to throw head and Dubuque continues to work the lead leg with kicks. They clinch on the cage briefly but return to range with both fighters throwing heat and Castillo looks to be landing the more significant strikes. Castillo is fighting with his hands down welcoming Dan to engage in a striking battle as Dubuque puts together some combinations. Castillo clinches and takes Dan down but Dan gets right back up and has the back of Castillo before pressing him against the fence, they split as the round ends. 10-9 Dubuque. Round 1: Caio comes out throwing everything but the kitchen sink at Spicely and he is landing at a good clip but Eric survives. Spicely seems to have no answers for the stand up of Magalhaes as he lands a nice left hand followed by a big body kick. Caio looks to jab and pokes the eye of Spicely and referee Kevin MacDonald calls time, Caio comes out of the break with more heavy hands and feet that back Spicely up. Spicely finds some distance of his own this time as he backs Caio into the cage and looks to take him down but Caio fends off the attempt. Eric connects with a knee coming forward followed by a right hook that shuts the lights out on Caio Magalhaes and gets the stoppage from Ref MacDonald. Decision: Eric Spicely defeats Caio Magalhaes by Knockout at 4 minutes of the first round. Round 1: Bessetts comes out working the angles and throwing kicks all the while not being touches by the return fire of Dooling. Dooling throws a kick and Bessette dodges it and lands a huge spinning back fist that buckles the knees of Dooling but Dooling returns to his feet for more. Matt lands a sharp overhand right that gets the attention of Dooling as the stand up of Bessette looks too high level for Dooling to handle. Bessette connects with another right that drops Dooling and Bessette follows him to the ground with elbows but cannot finish. Bessette ends up in the guard of Dooling landing some elbows as Dooling works his way to the feet and the round ends. 10-8 Bessette. Round 2: Bessette lands a couple damaging uppercuts early and things aren't getting any better for Dooling on the feet. Bessette lands another thunderous right hand as he continues to pick Dooling apart. Bessette clinches and lands some dirty boxing and lands a kick to the body on the break. Bessette shoots and takes Dooling down and gets his back but is at a weird angle and shifts to side control where he continues to dominate. Dooling gets back to guard but Bessette is on top working the body of Dooling with strikes. Dooling escapes with just seconds left in the round and looks to throw a cartwheel kick as the round ends. 10-9 Bessette. Round 3: Both fighter land some combinations early but round three starts out a little slower then the first two. Dooling comes forward and lands his first takedown of the contest as he looks to work from dominant position for the first time but Bessette escapes back to his feet. Dooling lands some hands but Bessette first back with a combination that ends with a headkick that just misses the button. Bessette goes back to what won him the first two rounds and again starts to pick Dooling apart standing. They stand in front of each other for the last 10 seconds and slug it out until the final bell sounds. 10-9 Bessette, close round but hey we are in Bessette's hometown. Decision: Matt Bessette defeats Tim Dooling by Unanimous decision (30-27, 30-27, 29-28). Round 1: The Champion comes out throwing the first round of strikes as he looks to get that push kick working. de Jesus has taken the center of the cage and looks to back Wells up but Wells explodes across the cage and looks to pressure Vinicius against the cage. Vinivius gains separation and returns to the center and Wells comes forward with a spinning kick that sets de Jesus down. Vinicius gets back to his feet and they remain at distance until the bell. 10-9 Wells. Round 2: Vinicius throws a kick to open round 2 and falls on the canvas, Wells pounces and looks for the takedown abut Vinicius keeps his feet. Wells shoots for another takedown and gets it but de Jesus gets right back up and takes some shots from Wells for his efforts. Wells once again comes forward and uses strikes to try and set up the clinch but Vinicius circles and keeps himself at striking distance. de Jesus gets in some nice lower leg kick from the outside and Wells answers with some looping overhands. Vinicius fires a right hand that clips wells and gets the crowd going a little bit as the second round ends. 10-9 de Jesus. Round 3: The Champ opens up with a right hand and a glancing flying knee, Vinicius lands another loud lower leg kick to get Wells attention. The Challenger de Jesus looks to be settling in a little bit here and doing well countering the strikes of Wells. Wells mixes in a push kick but Vinicius eats it and comes forward, and Wells tags him a little on the way in. 10-9 de Jesus. Round 4: Wells looks to get his striking going again to start the round but Vinivius is relying heavy on his counterstriking, Vinicius' next counter lands to the cup of Wells. After the break Wells puts together possible the best combination he has thrown over the last 3 rounds, but de Jesus continues to hold the center of the cage and counter any of Wells' offense. Wells fire a headkick followed by a right hand and both just miss their marks. Vinicius lands a glancing wheel kick that has the champ on his bike where he spends the remainder of the round. 10-9 de Jesus. Round 5: Wells comes out throwing but he needs to have more sense of urgency than this, he needs to finish this fight to retain his belt. Vinicus starts backing the champion up again and lands a nice kick to the thigh of Wells. Vinicius is putting Wells back on that bike and Wells needs to remove the training wheels if he wants to keep his strap. Wells lands a couple of shots but they are single shots with nothing behind them. Wells lands a right hand coming forward as that sense of urgency seems to be setting in. Vinicus finishes the fight with a sharp kick to the mid section of Wells. 10-9 Wells. Decision: Vinicius de Jesus defeats Jeremiah Wells by Unanimous Decision (49-46, 48-47,49-46) to become the NEW CES Welterweight World Champion.